LASIK is an acronym that stands for Laser Assisted In-situ Keratomileusis and is one of the most advanced ways to permanently correct refractive errors (glasses prescriptions). LASIK surgery is performed by creating a hinged flap of tissue approximately 1/5 of the thickness of the entire cornea. This flap is gently lifted and the excimer laser is used to change the curvature of the remaining cornea to correct your prescription. Once this is completed, the flap is replaced–back into its original position. LASIK has become the most frequently performed refractive surgical procedure performed today. Its wide acceptance can be attributed to the minimal discomfort that patients experience with this procedure and the rapid visual recovery that they enjoy post-operatively. LASIK surgery can be performed using a Conventional treatment approach or a Custom treatment approach. Conventional LASIK uses treatment data based on your eyeglasses prescription – which is an average of the many different ways that your eyes focus light incorrectly. This approach has a good chance of fully correcting your prescription with one surgery. 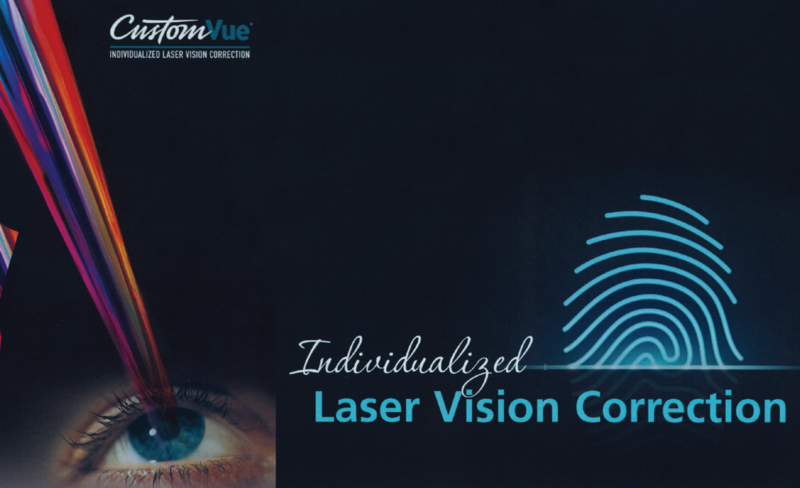 Custom LASIK (Wavefront guided LASIK) – This approach represents the latest technological advancement in laser vision correction. The Custom treatment technique creates a personally tailored correction for each individual. WaveScan® technology captures unique imperfections in each individual’s vision at over 200 points on the cornea that could not have been measured before. This new level of measurement provides 25 times more precision than measurements using standard methods for glasses and contact lenses. WaveScan® evaluates more than nearsightedness, farsightedness, and astigmatism; it captures other, more specific imperfections affecting an individual’s vision. This data is then used to generate an individualized Custom LASIK procedure offering the greatest vision potential post-operatively. Surgeon creates a thin corneal flap with the Intralase® all-laser system (the most modern technology) or a Microkeratome blade. Monovision–one eye corrected for distance, one corrected for near. This has been used effectively in contact lens wearers for many years. Corneal Inlays–coming soon–currently undergoing FDA trials. These devices will be placed beneath the LASIK flap and will allow both good distance and near vision when placed after a LASIK procedure. Ultimately, you make the decision about your vision correction. The realistic goal of LASIK is reduced dependence on glasses and contact lenses in the many and varied activities of your life. To achieve your best level of vision and function without glasses or contact lenses, it is very important that you thoroughly discuss your vision goals with the refractive surgery staff. A laser device which uses light energy to very precisely create the LASIK flap. A mechanical device which uses a rapidly oscillating blade to cut a thin corneal flap. Safer, more predictable flap creation — less chance of complications in creation of flap; i.e., buttonholes, incomplete flaps, free flaps. *Only LASIK with Intralase is permitted on US Air Force pilots, US Navy aviators, as well as NASA astronauts.